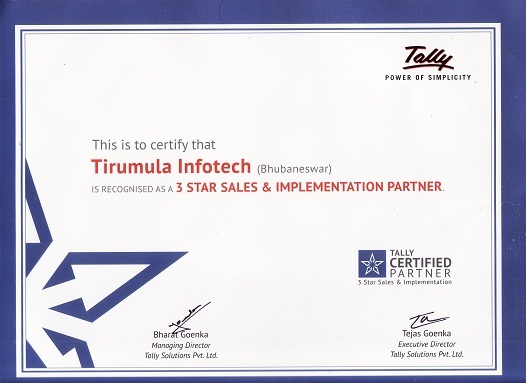 Tirumula Infotech - with a rich experience in the implementation of Enterprise business solutions on Tally enterprise framework - offers a complete solution, which includes consultancy, design, development, implementation and training. We enhance value to our customers by bringing to the table an excellent understanding of business processes. We follow a well-defined methodology that enables customers to exploit the benefits of Tally quickly, and in most cost-effective manner possible. We has an excellent track record in IT consultancy and services, serving customers in varied sectors such as Manufacturing, Bulk Drugs & Chemicals, Engineering, Packaging, Pharmaceuticals, Distribution, Trading & Government. 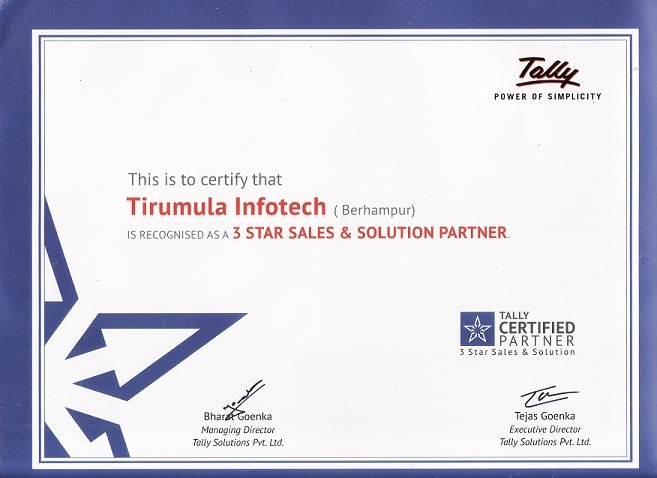 We have been associated with Tally for over 8 years now. A whopping 2000+ customers have played a significant role in its success. Over the years, we had spread Tally's customer-base all across the Orissa, by consistently providing solutions on Tally.